We've only just welcomed in the new year yet the first festival of 2019 is nearly upon us. Next weekend (11th-13th January) sees the fourth edition of Rockaway Beach and DiS will be in attendance over the course of its three days. 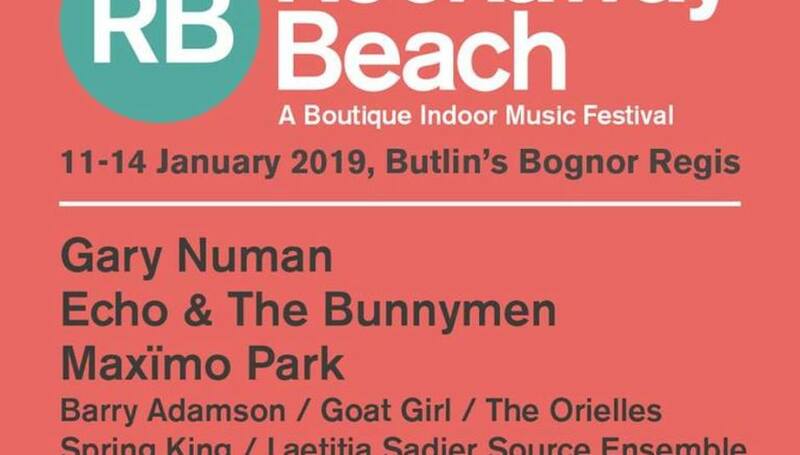 Situated in the Butlins holiday camp at Bognor Regis on the south-east coast, this year's event will play host to over thirty live acts, talks, and DJs with many DiS favourites scheduled to perform. What's more, the organisers have cleverly laid out the schedule so there are no overlaps between acts and stages, making it possible to see everything on the bill if you so wish. Tickets are still available, with prices varying dependent on accommodation. In the meantime, here are 10 acts we're most looking forward to seeing. Now based in Berlin, Eddie Argos and Art Brut put out their fifth long-player Wham! Bang! Pow! Let's Rock Out! last year and despite being their first release for seven years, it was as if they hadn't been away. Drafted in as late replacements here after Spring King called it a day recently, we suspect their Sunday evening slot on the Centre Stage will be one of the weekend's highlights. Coming off the back of arguably their most successful year to date, Desert Mountain Tribe make a welcome return to Rockaway Beach having initially played here in 2016. Expect a potent mix of material from their two albums, Either That Or The Moon and Om Parvat Mystery. Hard to believe as it may be, Echo And The Bunnymen celebrated their fortieth anniversary as a band in 2018, which is probably why they're one of the most popular bookings since Rockaway Beach started. With a back catalogue to die for, not to mention influencing a plethora of artists over the past four decades, their Sunday evening headline slot should provide a perfect finale to the weekend's festivities. Another artist whose roots lay in the original wave of punk, having put out his first record back in 1978, Gary Numan has been a pivotal artist at the forefront of numerous genres and movements ever since. Now, twenty albums into his career - the most recent of which Savage (Songs From A Broken World) came out to widespread critical acclaim in 2017 - his appearance at Rockaway Beach represents a bit of a coup for the festival. Having released one of 2018's finest debuts, Goat Girl are another welcome addition to this year's line up. While the likes of 'Country Sleaze', 'Slacker Drool' and 'Creep' have become live favourites with those who've seen them, expect one or two new songs in the set too. While news that Stereolab would be getting back together and playing Primavera Sound in May has us jumping for joy, Laetitia Sadier's solo show is another reason to be excited for Rockaway Beach next weekend. Performing with her Source Ensemble, expect to hear a career spanning set with maybe one or two surprises thrown in for good measure. De Facto, the fifth album from Mexican experimental duo Lorelle Meets The Obsolete is already an early contender for album of 2019. Come see what all the fuss is about when they take to the Reds Stage on Sunday teatime - we guarantee you won't be disappointed. Fusing post-punk and psychedelic rock with wistful and at times seedy lyrics, these four witchcraft fanatics from London have fast become one of the most entertaining live bands on the UK circuit over the past eighteen months. With a long-awaited follow-up to 2017's self-titled debut just around the corner, expect a smattering of new material alongside old favourites like 'Mermaids' and 'Cat Lady'. Another band appearing at Rockaway Beach off the back of their most successful year to date. 2018 started on a high for The Orielles and ended on one too, with debut album Silver Dollar Moment picking up numerous end of year plaudits and most recent single 'Bobbi's Second World' also receiving high praise in many places. This Edinburgh four-piece have been making a name for themselves on the DIY indiepop circuit for some time now. Third album Could It Be Different? came out last year on American independent Slumberland Records and represents arguably their finest body of work to date. For more information on Rockaway Beach, including where to purchase tickets and full running orders, please visit the festival's official website.